Tomorrow is Ash Wednesday, the first day of Lent. We go to Mass and afterwards, the priest gently presses his thumb in burnt palms from last year and makes the sign of the cross on our forehead. It winds up looking more like a circle, but we know a North, South, West, East mark was made on our forehead. “Remember, I beseech thee, that thou hast made me as the clay, and thou wilt bring me into dust again.” (Job 10:9) These words or a paraphrase of them are said as the priest makes the sign of the cross on our forehead. “Why, this ritual?” we should ask ourselves. Especially since the Gospel in the Ash Wednesday Mass makes it quite clear, how we should fast, and how we should do good. “When you give alms, sound no trumpet before you”, and again “when you fast, do not look dismal”, and still again, “that your fasting may not be seen by men but by your Father”. (Matthew 6: 1 – 6, 16 – 18) It seems almost like a contradiction. We wear ashes and yet are told to wash our face, to not appear any different to our fellow man. The fact is, we don’t wear the ashes to proclaim our holiness, or to appear to all that we are getting ready to fast, but rather to acknowledge that we are a community of sinners in need of repentance and renewal. It is only when we look into our souls and recognize all that is preventing us from truly uniting with Jesus we begin to understand our life, our direction. Maybe, this should be said in a different fashion. Our desire to be so united with Jesus gradually frees us and allows us to understand what it is that is keeping us from getting closer to Him. 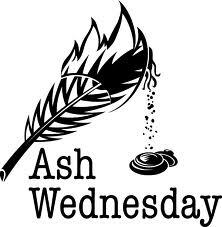 The ashes that we wear on Wednesday, do remind us that we are sinners in need of repentance. They should also remind us that Jesus died for us, loving us. We, who have so many imperfections and sins, are understood and loved. THAT is what breaks the bonds holding us back. His love for us, His total all-encompassing Love frees us. We can look at ourselves and our fellow man, recognizing that all of us are struggling with the same problems, the same sins, the same proud actions and all of us are loved. No one person is better than anyone else. No one person can look down on anyone else and feel superior. We are all struggling, all loved. This Lent, whatever acts of self denial we choose to perform, let them be actions that cost us something, and not be actions that make us feel good about ourselves. We can give up smoking, or candy, or something that we like. We could also do something for someone else. Do we know someone who is home bound? Do we know someone who is lonely, grief-stricken, or depressed? What can we do for them? YOU who have suffered through illnesses, and grief, and depression, YOU who have struggled with sins and despair, YOU can quietly bring the love of Jesus to someone. How can you? You can, because Jesus loves you. This Lent is a time for all of us to bring Jesus’ Love to the world, the world of our friends and acquaintances. Let’s have a great loving Lent! This is a meditation that should be read EVERYDAY in Lent, and probably everyday of the year. I’m so grateful and appreciate your beautiful thoughts. « Where is Your Belief Leading You?